The Activity tab of the Environment Details page displays the most recent activity for an environment. From the Environment Details page, click the Activity tab. The most recent activities for the environment display (up to 20 activities). Vnc session – A user, administrator, or anonymous sharing portal user has accessed a VM desktop using the SRA browser client or SmartRDP. 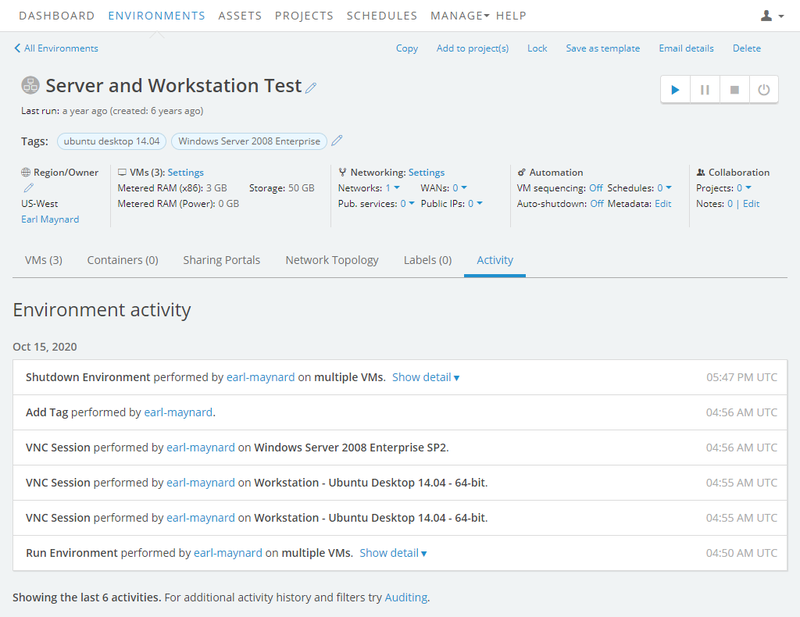 Merge environment – A user or administrator added VMs to an environment. Create tunnel – A user or administrator connected two networks in different environments using ICNR. Additionally, you may see automated actions performed by Skytap. For example, if an environment is automatically suspended or shut down after a period of inactivity or at a set time, it is suspended by a Skytap task named usage_control. For detailed explanations about each of the activities, see Description of auditing activities.